More than 400 people have backed a campaign to save the only weekend bus service in a north-east village from being scrapped. 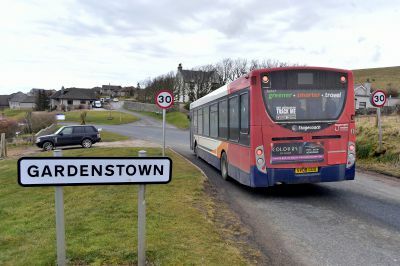 The 273 Saturday service connects Gardenstown with Banff and Fraserburgh, but it will come to an end from April. It is one of the council-backed routes that will be withdrawn due to funding cuts and residents argue the move would leave the Moray Firth community without a public transport link from 6pm on Friday until 8am on Monday. They have now launched their own fightback against the move with a petition circulating around the village and online. It attracted 427 signatories and the residents behind it have now handed over the document to council bosses. Nicola Thom and Andy Sturdy presented the petition to Aberdeenshire Council’s transport chief Ewan Wallace on behalf of their fellow villagers. Mr Sturdy, secretary of the Gardenstown Village Action Committee, claims the nearest weekend bus service is eight miles away in Macduff. He says the community is unhappy at the way the decision to axe the 273 was made by the local authority. Mr Sturdy added: “The public were not given the opportunity to respond to the proposed cut, prior to a decision being made, and advertising to advise on the proposed cut which affects the only service on a Saturday between Banff and Fraserburgh was not carried out adequately. The petition has been formally lodged and it is expected to be considered by the Banff and Buchan area committee. Operator Stagecoach runs the 273 on behalf of the council and it is one of 29 services being either completely axed or replaced with a dial-a-bus option. A council spokesman confirmed Mr Wallace received the petition from the campaigners.